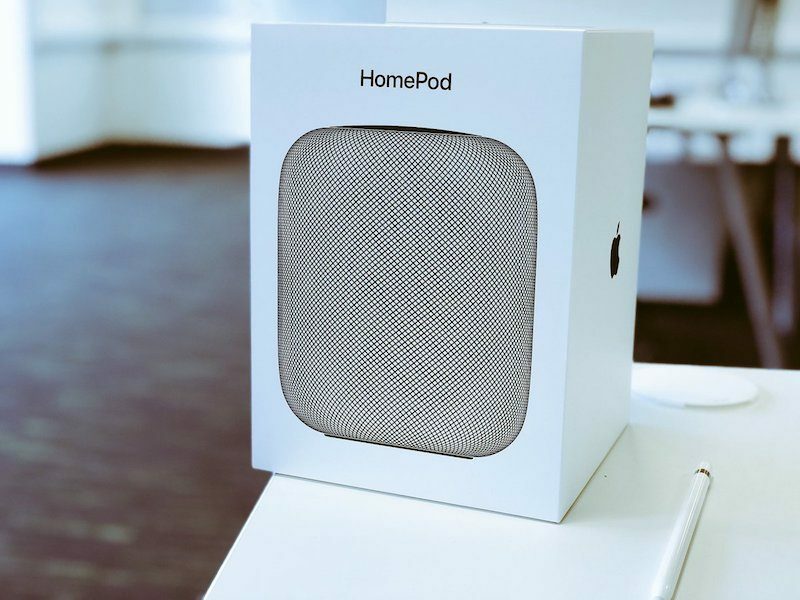 Today is HomePod launch day in the United States, United Kingdom, and Australia, and as promised, the speaker is now on display and available to purchase at most of Apple's retail stores in each of those countries. HomePod has already received rave reviews for its sound quality from both the media and early adopters, but customers who prefer their own listening demo can now visit one of Apple's stores to hear it for themselves. Of course, customers can also take advantage of Apple's 14-day return policy and try it at home. Most if not all of Apple's retail locations currently have plentiful stock of the speaker in both Space Gray and White, but we recommend calling ahead before making the trip. 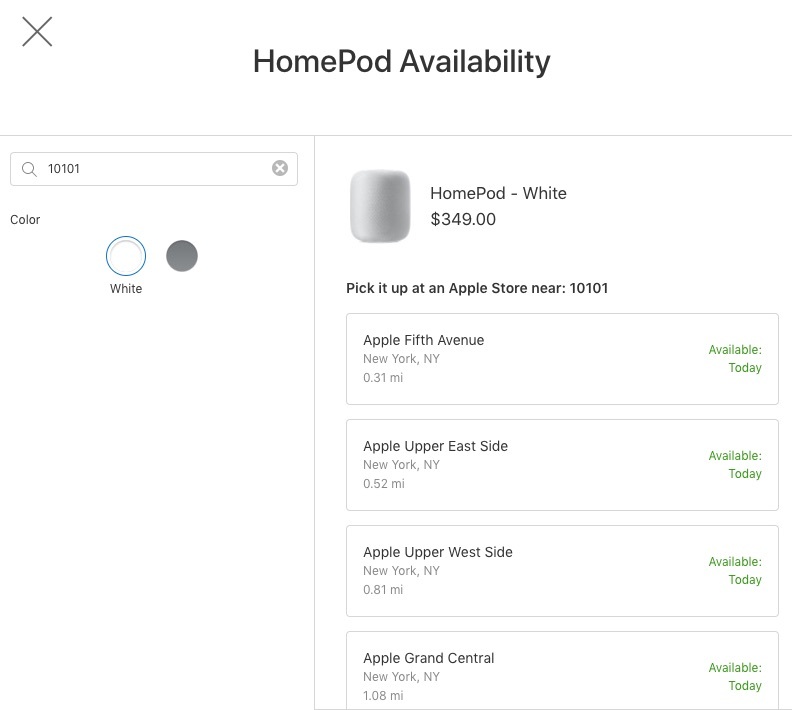 To check availability in your area: go to the HomePod order page, click on the link under the "Pickup" section, and enter your ZIP or postal code. HomePod orders placed online today are estimated for delivery by Tuesday or Wednesday of next week, so if you didn't pre-order the speaker, visiting an Apple Store is the only option to get one in your hands this weekend. Some resellers like Best Buy may also have limited in-store availability. Meanwhile, deliveries are beginning to arrive to customers who did pre-order the HomePod a few weeks ago. If you've received yours already, be sure to share your thoughts in the MacRumors discussion forums. If this thing had a better relationship with Apple TV, it'd be something to consider. Since it is just for music, I wouldn't use it often it enough to justify it. I can't wait until Big Brown pulls up in front of my house and hands the HomePod to me later today! In the meantime, in spite of the HomePod receiving rave reviews, I'm sure the haters that love to hang out in these front page articles will be lining up to make their comments...in fact, it has already begun! People make WAAAAAY to much of availability. It's a pointless metric by itself. It's so silly that people use it as a basis to claim a product is a hit or dud or being held back to gin up demand or whatever. No, you cannot infer anything by availability or unavailable alone a bubble. Sorry. I just picked up my pre-order unit at the Stanford Apple Store. It was a pretty cool experience. Being close to Cupertino, they had the HomePod technical development staff at the store. As an engineer and being very interested in adaptive beamforming (I used to work in that area in another domain) I was able to find and talk to the engineer in charge of the beamforming aspect of HomePod for 15 minutes or so, and came away super impressed. First Apple product not back ordered for weeks? Seems like there is a lack of demand. I don't need one, do not buy. I don't need one, do not buy. As one sits in my shopping cart in the app. It's not even really good. It's a $50 product (lower feature level than Amazon or Google) for more than double their price. I want Apple to make good products. I don't get upset when their good products are expensive when they're good values. This is not a good product or a good value. Apple goofed. Most people already have speakers. Does this do something that special for them to drop close to $400? Actually it probably does less since it doesn't play well outside the walled garden.